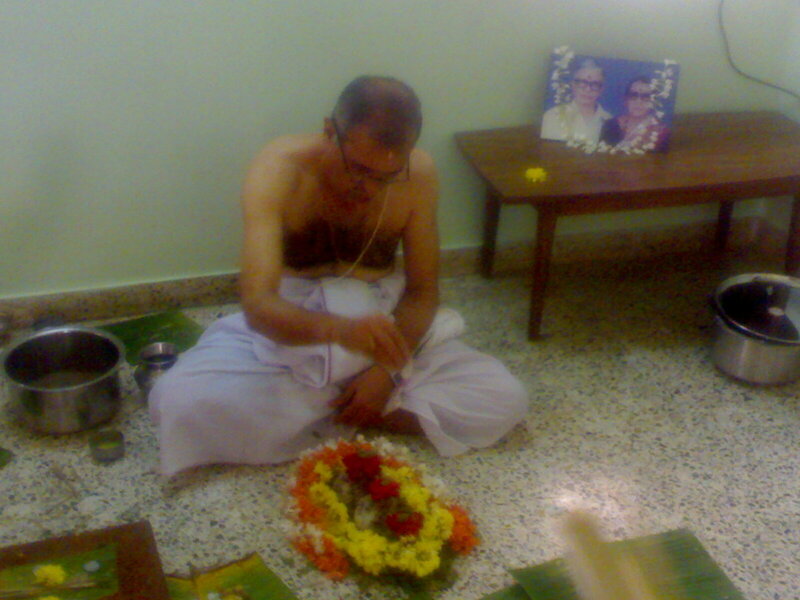 Kamath's Paradise: Remembering the departed soul in Vedic way! Hi friends, Indian civilization is the oldest one and it has produced many precious gifts to man kind. Vedas are the oldest Sanskrit literature in which one can have the deep knowledge of Indian way of life. Vedas are compiled over a period of time and till today most of our day to day rituals are having connection to any of the four Vedas, especially Yajurveda. From birth to death during various occasions specific rituals are performed and a trained priest will be engaged if the ritual is complicated. After the death of parents, death anniversary (shradda) will be performed by their children either on the day of the death as per Hindu calendar or during mahalaya period. In our house at my native place, every year we perform our parent’s death ceremony and under the guidance of our family priest all rituals are carried out. My knowledge about Veda is almost zero but I believe if every ritual explained in these sacred books if performed systematically, then it is going to produced enormous amount of positive energy. During the rituals I used to follow the instructions of the priest mechanically but my mind remembers my parents and good things they have done towards us. I feel this ritual for a common believer like me is an opportunity to remember parents and express my gratitude in the form of offering. I heard that there are many complicated rituals like perjanya yagna from which we can make it rain at any time. Rituals explained in Vedas are for the betterment of man kind and they replace the negative energy created by our inhuman activities with Divine energy. We were in Kochi last week to perform the sraddha of my Pa and Ma in law. Rituals apart it is a day to remember their good deeds. yes, true. Yoga and vedas are two things i admire the most.it would be great if we, youngsters understand the meaning of these vedas .